The Senior Mare Championships was an exceptional line-up of glistening white pearls. Turning heads in every ring she enters with her wonderful personality and charisma, it is clear Estokada K.A. entertains crowds and making headlines throughout her career. 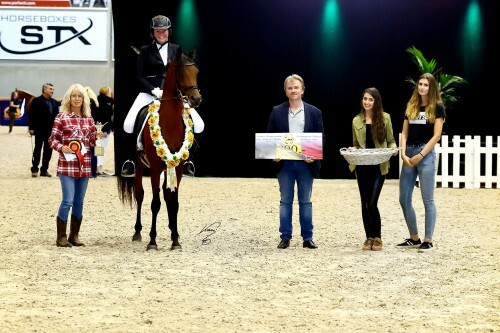 When the four years old QR Marc daughter entered the ring at the Belgian Nationals at Sentower Park in Opglabbeek she turned heads of the crowd and judges likewise and garnered unanimous Gold Champion Senior Mare, three years after her success as a yearling when Estokada K.A. was named Gold Champion Yearling Filly and Best in Show. 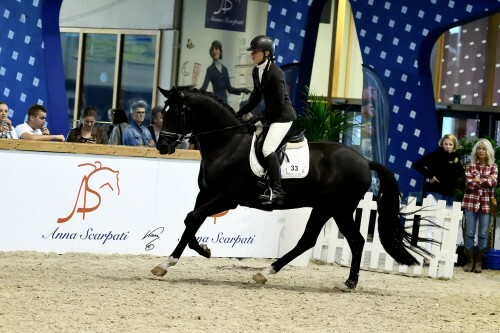 Estokada K.A., bred and owned by Knocke Arabians, also won the award for Best Belgian owned horse and is out of the wonderful Michalow bred mare Espadrilla, by Monogramm and Emanacja by Eukaliptus, twice Polish National Senior Reserve Champion. 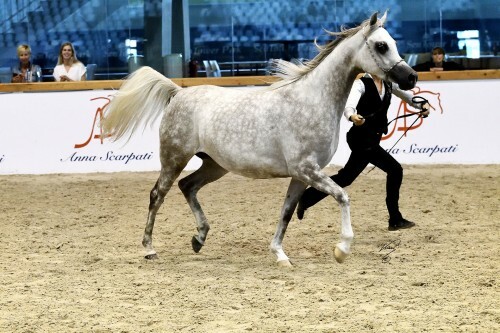 Silver was also a unanimous decision and went to DB Arabians’ Szakira, by WH Justice, with the Ekstern daughter Suzanna, bred by DB Arabians and owned by Agmal Arabians, winning unanimous bronze. 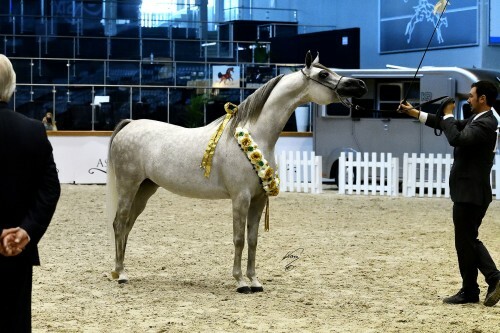 The Senior Stallion Championship saw three big moving bays with the Enzo son Al Khabeer-D, bred by Dion Arabians and proudly owned by Mrs Detremmerie, achieving unanimous Gold Champion Senior Stallion. Al Khabeer-D’s dam is the bay mare Khabala by Nagadir (by Neman out of Neschi) – and out of Korona II by Koronec and Miss Ambernado, so mostly Russian bloodlines. Silver winning Davos K.A., by QR Marc, was bred by Knocke Arabians and is owned by Florentina Arabians. Bronze went to Chainel, by Psytadel, bred by James Swaenepoel and owned by Charlotte Matthys. Agmal Jahiddah is by WH Justice out of Erabea, herself a daughter of precious Elandra from the world famous dynasty of Michalow’s E champions; the very same female line as Estokada K.A. Bronze Champion Junior Filly went to Miami J, by RFI Maktub, bred and owned by Jadem Arabians while Knocke Arabians was again successful with another QR Marc produce, the bay Santin K.A. achieved silver. This was not to be the last time that Knocke Arabians received an award. The Championship Junior Colt ended with a great success, Knocke Arabians bred all three colts. Magnums Volcan K.A. received the rosettes for Gold Champion Junior Colt. He is an exceptional moving QR Marc son, this time in chestnut, a color he probably inherited from his grandparent. QR Marcs dam Swete Dreams was chestnut while on the maternal side of Magnums Volcan’s pedigree his dam FS Magnums Madonna is by chestnut Magnum Psyche. Emperor K.A., of course by QR Marc, achieved silver and bronze went to Epic K.A., this time by Espressivo and therefore a QR Marc grandson. Epic K.A. is owned by Florentina Arabians. There was no special award for Best Sire but without question, the gorgeous 2012 World Champion Senior Stallion QR Marc would have deserved such a title. Among Frances Atkinson’s highlights were the foal classes: “In the very well supported foal sections, a bay filly caught my attention as soon as she entered the arena. 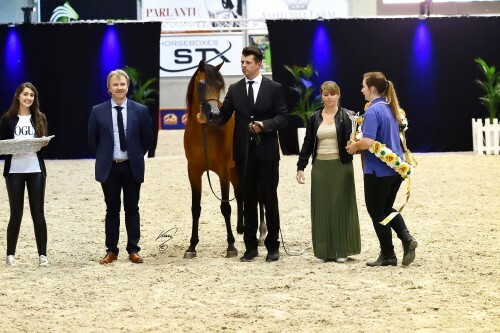 Ultra refined, correct and bursting with Arabian type.” The winner out of ten fillies was Pearl Eden K.A., by – you might have a presumption already – QR Marc and out of Prisma, bred and owned by Knocke Arabians. Haras de Croissart is the proud breeder and owner of the second place, Persia de Croissart by Jaipur El Perseus. “The winner of the colt foal class was also of outstanding type and thoroughly deserved to triumph in his section,” Frances continues. “I must confess to being completely dazzled by the more mature, second placed, chestnut colt whose condition and coat sheen reflected like burnished gold. He was a high quality foal indeed and showed himself as well as any adult horse, with incredible composure and much joie de vivre.” Again a foal by QR Marc, bred and owned by Knocke Arabians, took the first place: Justify K.A. out of Jolfa de Nautiac. Second became the Fayad Al Fayyad son Moncino DD, bred and owned by Dirk de Jockheere. The show also offered several ridden classes with the most starters in Classic and Hunter Pleasure. Haras de Croissart was happy about Golden Eyes de Croissart, by MCA Magnum Gold, winning Classic Pleasure with Kroton, by Efekt, and N.H. Fahd Arcu, by Nibakan El Jerez, as second and third. Kroton was also the winner of the Hunter Pleasure class. Second in Hunter Pleasure was MJ Cantress, by JK Catalyst, and third place achieved aforementioned Golden Eyes de Croissart. We wish to thank the Belgian Arabian Horse Registry for hosting the 2017 Belgian National Championship Show, and for partnering with Arabian Horse Results.